I am proud to showcase a recently completed and challenging renovation project successfully accomplished by our Service and Tonal Departments, to give you a glimpse into the depth of our firm, and the differing types of projects which we regularly and successfully undertake. We have developed an outstanding national reputation for new organs, and are quickly becoming known for the professionalism and sensitivity we apply to restoration, renovation, and rebuilding projects. Some years back The Diapason magazine featured a renovation project of ours at First Presbyterian Church, also in Lexington, KY. (to which project we assigned our Opus number 34-R). Word of the success of this project quickly sped through the community, and we were contacted by Maxwell Street Presbyterian Church’s Music Director, Clif Cason, about the possibility of giving their 1963 Rieger tracker action organ a mechanical and tonal “going over.” He and the parishioners at Maxwell Street Church liked the transparency and vigor of the organ’s neo-Baroque style, but weren’t convinced of the inharmonic noise in the flue voicing, nor were they entirely happy with the unstable and thin-toned reeds. The organ also exhibited mechanical symptoms which warranted inspection. We discovered that the pallets had been covered in a foam-rubber substance, which was becoming sticky and gooey. Additionally, the felt bushings in the keyboards and pedalboard had worn to a point at which the action was clattery. The organ leaked wind inordinately, especially where the pull down wires exited the slider chests’ pallet boxes. 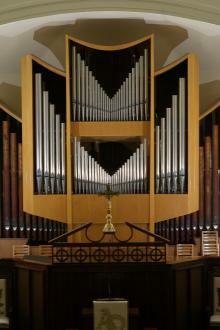 We also were regaled by anecdotal information that the organ was impossible to tune, or keep in tune. Tonally, the organ was not a happy instrument. 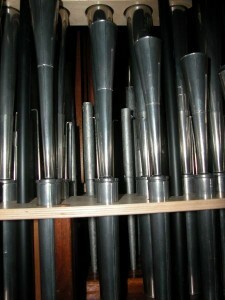 Years of heavy cone-tuning had done its damage, especially to the small mixture pipes in the organ. Tuning scrolls on façade pipes and the larger flue pipes on the chests had been rolled down too far, and could not tune flat enough (a discovery we made in the voicing studio). Throughout, the sound was noisy, with a disproportionate amount of speech articulation, scratchy-ness in the tone, and in the case of the small mixture pipes, quick speech to the point of over-blowing an octave. The reeds’ resonators were too short to couple to the pitches which the reeds’ tongues were producing, contributing to a thin and unstable tone. All of us, Church and Builder, wanted to respect the organ’s original construction and style, consonant with the neo-Baroque ideals of the “werkprinzip” concept of divisions’ and stops’ hierarchical orders. 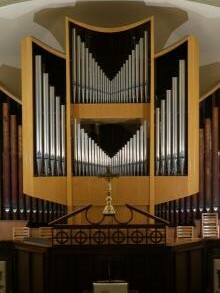 But we all also wanted the organ to become more inherently musical from pipe to pipe, and stop to stop, balancing one another in proper musical proportion. 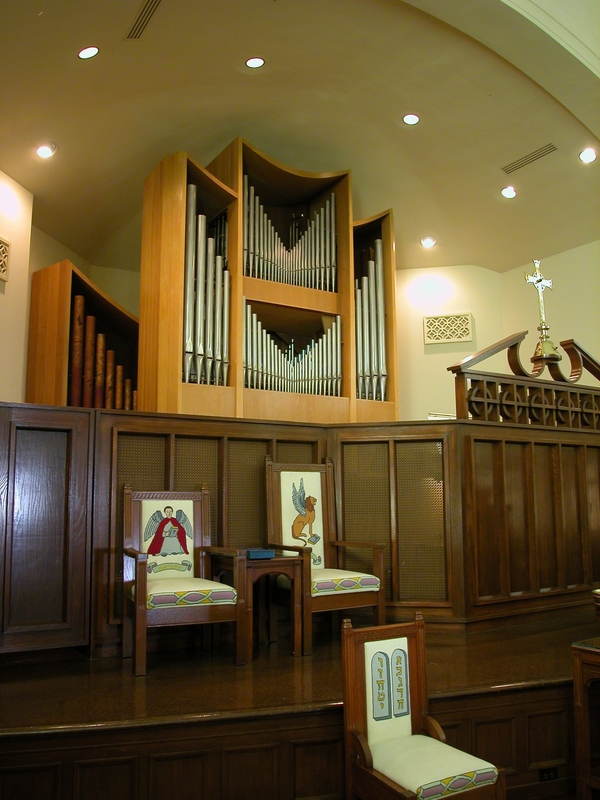 The first instrument with which I became intimately acquainted in my professional life was a large 1965 neo-Baroque organ installed in the Recital Hall at the University of Illinois. During my curatorship there I developed sensitivity and technique to deal with flue-regulated (open toe) styles of flue pipe voicing and regulation, re-regulating all the flue stops under the watchful eyes and ears of Professor Jerald Hamilton. Our Tonal Director, Brian Davis, came to us from Visser-Rowland & Associates and was intimately familiar with flue-regulation voicing, but also the significant achievements in neo-Baroque reed making which had been made by German reed pipe maker Roland Killinger in the late 1960s. These developments produced neo-Baroque style reeds of excellent tone and tuning stability, even though voiced on very low wind pressures. Ironically, just as Mr. Killinger’s experiments began to produce results, the neo-Baroque trend ended, and few of these new reeds were ever made – until this project. All of us had a turn to inspect this organ: General Manager Charles Eames (also a VRA alumnus), Brian Davis, Service Department Director Keith Williams, and myself. We all concluded that the existing flue pipes could be physically restored and the voicing amended for a significantly improved musical result. However, the reed pipes needed to be replaced. There was a half-length 16’ Posaune in the Pedal, but it was of such small scale, producing no fundamental pitch, that we opted to place a nicely scaled 8’ Trompete in its place. 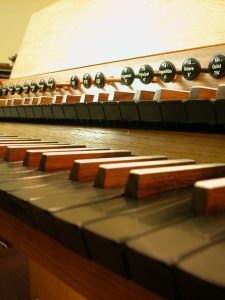 Music Director Clif Cason has envisioned a second phase of the project to be the installation of a Pedal 16’ Offenbass and a new full length 16’ Posaune of generous scale, in the back of the organ. At this writing we believe the Posaune will become the first priority of the project’s future second phase of improvement. We re-covered the pallets with felt and leather, modifying their opening action to accommodate a slightly differing thickness of material. All the deteriorated seals around the pull down wires were refurbished. Keyboards and pedalboard were restored; tracker “combs” which had been removed were replaced; small “bleed” holes were drilled into the slider chests’ tables; the action was re-hung and balanced properly. Since re-regulating the action and eliminating the flaws we found in our initial inspection, we have discovered that several of the steel needle-axles which act as a bearing for the actions’ squares have worn and will upon occasion jump out of their bearing clevises. Replacement of these axles will be a future maintenance operation. In order to get as much sound from the relatively small scaled 16’ Subbass pipes (stamped “Lieblich” by the way), the corrugated tubing connecting the toe holes on the chest to the toes of the pipes screwed onto the case was replaced with larger diameter tubing, and we installed “lifters” onto the pallets, so that the pedal action would be able to open the pallets farther. All of the organ’s pipes (except the largest wood pipes screwed onto the case sides) came back to our workshop for cleaning, repair, and re-voicing. The damage to the small pipes by heavy cone tuning was too significant to warrant restoration of the cone-tuning system, so we installed stainless steel tuning slides on the smaller pipes, and restored (in many instances replaced) the scrolls on the larger pipes. While we had the pipes out we also removed the toeboards, both to allow us to vacuum clean the chest tables and sliders, and to use the toe-boards as templates in the manufacture of new toeboard overlays and new racking for the new reeds. We observed that the organ used modern-style spring-loaded slider seals, (which is fine) except that from about middle “C” upscale these sleeves were sealed with diaphragms of pneumatic leather – all of which were ripped and leaking. 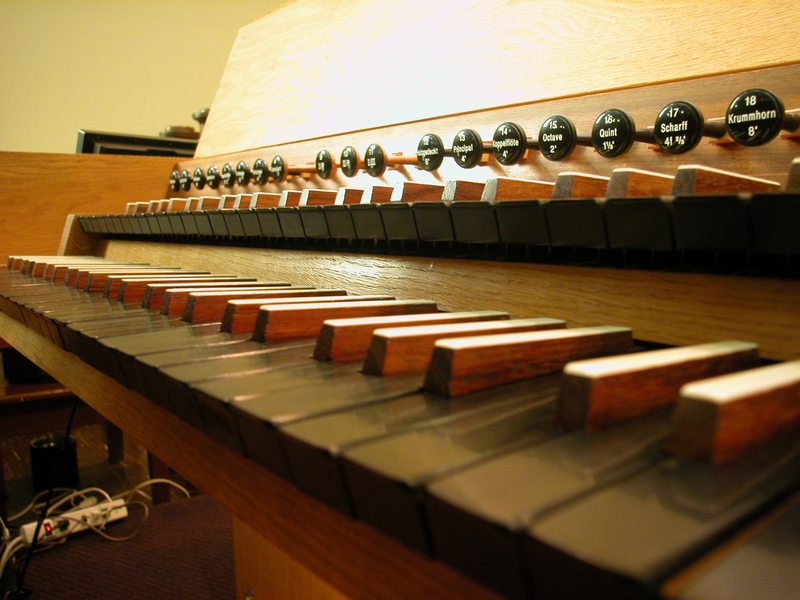 No wonder this organ never could be tuned, and no wonder former technicians simply bashed and bashed those poor little pipes sharper and sharper – because they weren’t receiving enough wind, because of the leaking leather! New leather-less slider seals were installed in place of the originals. Not surprisingly, now the organ can be tuned, and stays in tune. 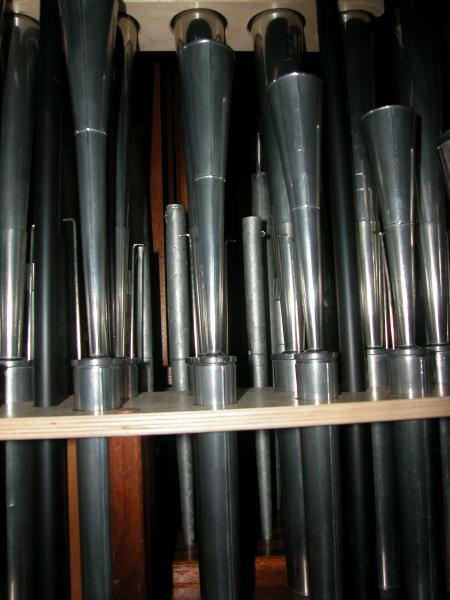 The re-installation of the organ took approximately two weeks, and tonal finishing occupied three weeks. The result is a phenomenally clean, clear, transparent, buoyant sound. The reeds are full and round, the direct result of Roland Killinger’s research from the 1960s. They are definitely faithful to the neo-Baroque style, but they are more inherently musical in our drier American acoustics. This organ, and our rebuilt organ at First Presbyterian Church, will be featured in the Regional AGO Convention to be held during summer of 2011 in Lexington. It is possible to work faithfully in a style which may not be one’s own when renovating an existing instrument. But, this takes complete subrogation of one’s self from the tonal and mechanical equation. Happily, our firm has the depth and experience to successfully undertake such a project, while at the same time developing our own personal style of modern organbuilding. Yes, I am a romantic at heart, a professional of mind, perhaps a pragmatist and dreamer all rolled into one. But so is everyone else on my staff, and we would love nothing more than to be a part of your worshipping community, whether it involves building you a new pipe organ, or renovating an instrument you have, with which you want to fall in love with again.